George Graham Reviews Ra Ra Riot's "The Orchard"
There's nothing like a good dose of eclecticism to spice up some ostensibly pedestrian music. This week we have a good example of that -- an alternative rock band who draw on some of the new wave ingredients of the 1980s and add a violin and cello. They call themselves Ra Ra Riot, and their new second full-length CD is titled The Orchard. Ra Ra Riot are from Syracuse, New York, and formed in 2006 on the Syracuse University Campus. They began to attract attention at first locally and then began touring more widely, opening for groups like Death Cab for Cutie, and then on their own in the UK. After being signed to a major label, eventually, their debut CD called the Rhumb Line was released on an independent imprint in 2008. The group suffered a tragedy in 2007 when their original drummer John Ryan Pike died in a drowning accident after a show in Providence, Rhode Island. But the group continued on. The current the members include lead vocalist and principal lyricist Wes Miles, bassist Mathieu Santos, guitarist Milo Bonacci, and the string section of cellist Alexandra Lawn and violinist Rebecca Zeller. The drummer throughout the new CD is Gabriel Duquette. Ra Ra Riot continues their relationship with Death Cab for Cutie by bringing in that band's Chris Walla to mix the CD, which was recorded in a house in a peach orchard near Penn Yan, NY -- hence the title. The result is ostensibly poppish music that repeatedly throws curves. Just when you think a tune is going to follow a familiar pattern, the string section will come in, or the music will shift rhythms. Mathieu Santos' pushy bass lines are usually straight out of 80s new wave music, with a strong rocky pulse, but the strings are never far away, and their presence gives things an entirely different texture. Wes Miles' vocals also have some of the high choppy sound hinting at facets of 1980s pop, but he has more charm than most of the singers from that era. The band's material is fairly opaque lyrically, with some variations of the love song, presumably. Musically is where Ra Ra Riot makes its mark with pieces that not only mix the nervous pop sound of the 1980s with the strings, but they also turn in fairly frequent rhythmic twists can make you think a tune is danceable, but then turn out to be in some non-standard meter or shifting rhythm. 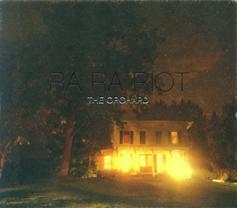 The Orchard the new second CD by the Syracuse-based band a Ra Riot is an interesting and appealing recording by a group who bring together the curious combination of 1980s-style alternative pop with strings. The sonic pastiche is further enhanced by the generally interesting writing and the distinctive vocals of Wes Miles. Our grade for sound quality is about a "B." Sometimes the studio effects in the mix are a bit clumsy. And as usual, there's too much volume compression, squashing out the dynamic range could have given more life to the string instruments. This is not the first time that a rock band has integrated some string players -- think ELO in the 1970s -- but Ra Ra Riot give the combination their own distinctive personality.